Don't miss out another second with gaining exposure to your Company branding and logo, with our latest and super-funky Company Clock in a Can promotional gift. There's no time like the present to hand out a business gift that is absolutely unique in every way, shape and form. Straight to the customers' desks and you'll add a chime to your corporate branding in a way you've never seen possible. Peel of the lid and you have your clock, pull out the stand from the bottom and it sits snuggly on the customer's desk, acting as your own little silent salesman! Tick Tock with our Company Clock in a Can and you can wind-up with more business than you thought possible! For a FREE QUOTE, please fill in the form regarding our Company Clock in a Can and we'll be able to help you. 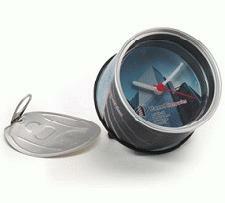 Why not try our other promotional clock in a can products?